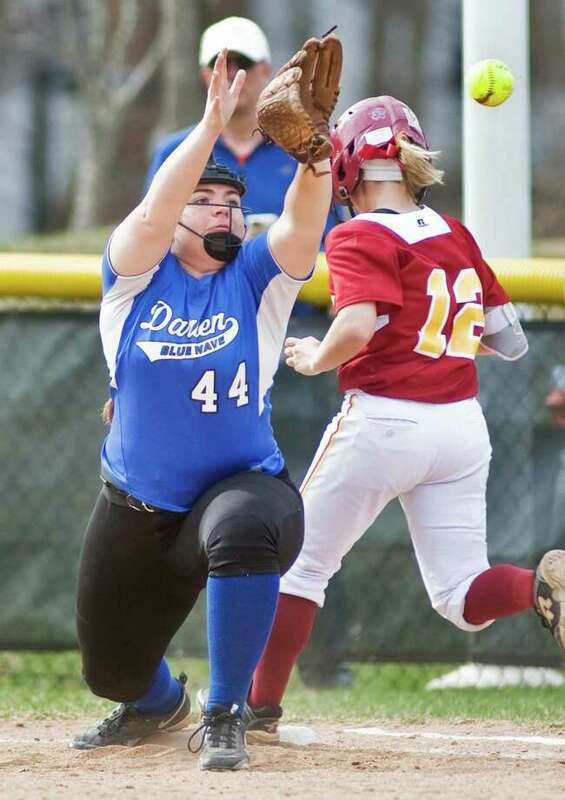 DARIEN -- The St. Joseph softball team lives by the motto "bend but don't break" and Wednesday at Darien the philosophy was put to the test. Leading by a run, the Cadets bent as far as possible with the Blue Wave loading the bases with nobody out in the bottom of the seventh. With the outcome in the balance, St. Joseph pitcher Nicole Williams induced three straight groundballs, sending the Cadets home with a 5-4 victory in a rematch of last year's FCIAC championship game. The game may have added a few new gray hairs to St. Joseph coach Jeff Babineau's head, but he said these are the type of games he wants his team to be in. "That's a great game, even for April," Babineau said. "We want to play 28 games this year and that is only No. 4, but to have this kind of atmosphere is good for the kids. They bend but do not break and our defense made two nice plays coming home and that's all you can ask for." In the bottom of the seventh, Darien loaded the bases with no outs on hits by Kristen Picard and Kelly Vodola and a walk to Erika Osherow in between. But a groundball to shortstop Lauren Pitney cut down Picard at home and a grounder back to Williams took care of Osherow at the plate. The final batter grounded to second and the Cadets (4-0, 3-0 FCIAC) were heading home with the victory. The Blue Wave (3-1, 3-1) trailed 5-0 before Vodola doubled for the Wave's first hit in the fourth inning, coming around to score on a single by Lexi Lopiano. Darien coach Nick DeMaio said his team was able to catch up with Williams after one time through the lineup. "I think the girls had to adjust their timing a little bit and once they went through the lineup they started having better at bats," said DeMaio, whose team lost in last year's FCIAC championship. "There are a lot of positives to take away from this game. You are down 5-0 to St. Joe's with (Williams) on the mound and it is easy for a team to check out and credit to our players that they didn't do that. The disappointing thing is how can you have bases loaded, no out and not be able to push a run through?" With two outs in the fifth, Darien strung together four straight hits with Cassidy Schiff driving in two runs with a single and Rebecca DeMaio bringing home another with a single of her own, cutting the lead to 5-4. St. Joseph went up right away with Pitney crushing a home run to left field leading off the game and Williams driving in a run with a single, making it 2-0 after one inning. "It was a little nerve racking in the end but our motto is `bend don't break' and we didn't break today," Pitney said. "My job as the leadoff hitter is to help my team out and I have their back and they have my back and it just feels great that they believe in me." The Cadets added one in the second on a single by Katie Gardella and two more in the fourth when Jo Hillman drove in two, making it 5-0. Osherow got into a groove on the mound after the fourth, setting the Cadets down in order the last three innings.